The wheel is the most crucial element of the bicycle: it allows the rider to roll over the ground with great speed and efficiency. Historians believe the wheel originated in Mesopotamia sometime around 3,500 BC. While the Sumerians did not pedal their way through ancient Mesopotamia, animal-powered wheeled chariots and carts helped haul goods and people for thousands of years. During the industrial revolution in the 19th century, advances in materials and engineering made it possible to use the wheel effectively in human-powered machines. The modern bicycle, complete with a steel frame, a chain drive, steel wheels and spokes, and pneumatic tires, would emerge in the late 1800s. 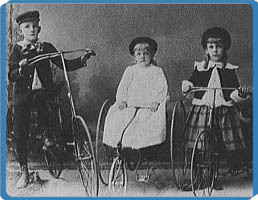 The wheels on these bicycles were made of steel but lacked pneumatic tires (with the possible exception of the boy's bike). Some bikes made for small children are still made with solid tires. This photograph was taken around 1910. While the use of the wheel was widespread in ancient times, it did have limitations. The resistance to the motion of a wheel can vary tremendously depending on the surface on which it is traveling. A rough road is much harder to roll over than a smooth one. The Romans were aware of this and developed a massive network of paved roads. While this may have been the first time in history that roads were improved to facilitate the wheel, it certainly wasn't the last. In the United States in the 1890s, cyclists successfully lobbied for improvements in roads nationwide, and with cycling the nation's most popular sport at the time, legislators listened. When most people think about early bicycles, the high-wheelers of the late 1800s come to mind. These early models had names such as the "Ordinary" or "Xtraordinary." In England, these bicycles were also known as "penny farthings" because the large and small wheels were reminiscent of the large one-penny coin and the smaller farthing coin. The pedals were attached directly to the front wheel of the high-wheelers. The larger the front wheel on an "Ordinary," the farther the cyclist would travel with each turn of the pedals. Exploratorium Senior Scientist Paul Doherty explained, "Every time the pedals would go around once, that whole giant front wheel would go around once. So, for one cycle of the bicyclist's legs he might go 140 inches (3.556 meters), a tremendous distance forward." This made pedaling up hills quite difficult, but allowed for great speed on the flats. BICYCLE INSTITUTE OF AMERICA This image shows an "Ordinary" bicycle. What is somewhat out of the ordinary is that the cyclist in the photograph is a woman. 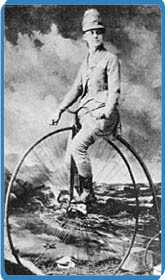 Although cycling became quite popular with women in the late 1800s there were still social taboos associated with it. The Exploratorium's Paul Doherty talks about the early high-wheeled bicycles. While the high-wheels were quite efficient, they were also dangerous: the cyclist was very high off the ground and perched precariously over the front wheel. So, while the high- wheelers broke new speed and distance records, they quickly gained notoriety for the dangers involved in riding them. The slightest obstacle in the road could result in a nasty head-first fall. "Headers" or "taking a header" were common terms used to describe an all-too-frequent problem. With a high center of gravity and narrow tires made of solid rubber (which occasionally could roll off their rims), high-wheeled bicycles were designed for speed, not for safety.